Obama To Limit Drone Strikes, Renew Effort To Close Guantanamo : The Two-Way The president said the death of Osama bin Laden and most of his top lieutenants, and the fact that there have been no large-scale terrorist attacks on the U.S. homeland, meant that a new policy was in order — one that concentrates on capturing, rather than killing terrorist suspects. President Obama speaks about his administration's drone and counterterrorism policies at the National Defense University on Thursday. President Obama on Thursday unveiled a major pivot in White House counterterrorism policy, calling for a limiting of CIA drones strikes and for a renewed effort to close the U.S. detention center at Guantanamo Bay, Cuba. Speaking at the National Defense University in Washington, D.C., the president said the death of Osama bin Laden and most of his top lieutenants, and the fact that there have been no large-scale terrorist attacks on the U.S. homeland, meant that a new policy was in order — one that concentrates on capturing, rather than killing terrorist suspects. "America is at a crossroads. We must define the nature and scope of this struggle, or else it will define us, mindful of James Madison's warning that 'No nation could preserve its freedom in the midst of continual warfare,' " he said. "Today, the core of al-Qaida in Afghanistan and Pakistan is on a path to defeat. Their remaining operatives spend more time thinking about their own safety than plotting against us. They did not direct the attacks in Benghazi or Boston. They have not carried out a successful attack on our homeland since 9/11," the president said. "We must define our effort not as a boundless 'global war on terror' — but rather as a series of persistent, targeted efforts to dismantle specific networks of violent extremists that threaten America," he said. Obama said that the May 2011 U.S. operation in Pakistan that killed bin Laden "cannot be the norm." "The risks in that case were immense; the likelihood of capture, although our preference, was remote given the certainty of resistance; the fact that we did not find ourselves confronted with civilian casualties, or embroiled in an extended firefight, was a testament to the meticulous planning and professionalism of our Special Forces — but also depended on some luck," he said. Referring to the administration's decision to acknowledge for the first time that U.S. citizens, including senior al-Qaida leader Anwar al-Awlaki and three others, had been killed in drone strikes, the president said he authorized the declassification of the information "to facilitate transparency and debate on this issue, and to dismiss some of the more outlandish claims." "For the record, I do not believe it would be constitutional for the government to target and kill any U.S. citizen — with a drone, or a shotgun — without due process. 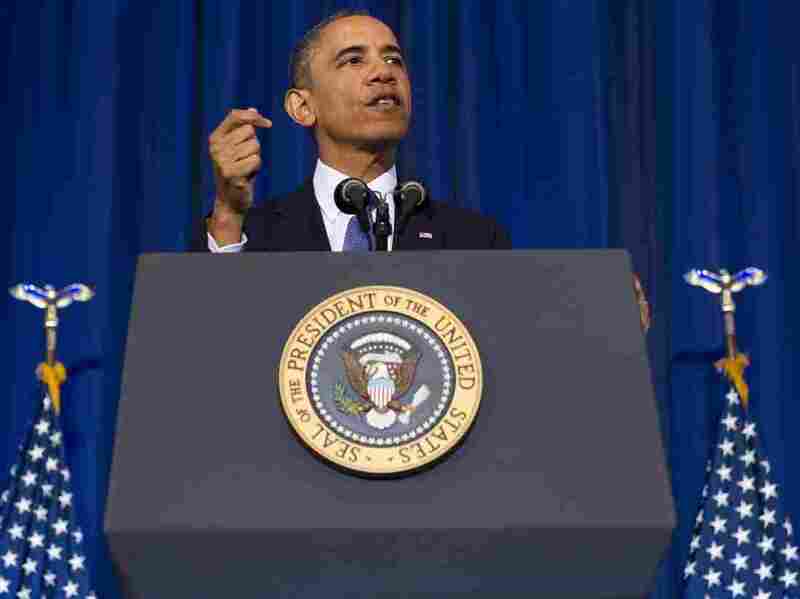 Nor should any president deploy armed drones over U.S. soil," he said. The president said that he was "implementing every recommendation of the Accountability Review Board, which found unacceptable failures" that led to last year's attack on the U.S. diplomatic post in Benghazi, Libya. He said he has asked Congress to fully fund efforts to "bolster security, harden facilities, improve intelligence" at U.S. diplomatic facilities abroad. Commenting on the Justice Department's subpoena of journalists' phone records as part of a leak investigation, he said he was "troubled" that it could result in a chilling of investigative journalism. "Journalists should not be at legal risk for doing their jobs," he said. "Our focus must be on those who break the law. That is why I have called on Congress to pass a media shield law to guard against government overreach." Obama said maintaining the U.S. detention facility at Guantanamo Bay was both expensive and problematic. "During a time of budget cuts, we spend $150 million each year to imprison 166 people — almost $1 million per prisoner." He said that as president, he had transferred 67 detainees from Guantanamo to other countries before Congress imposed restrictions to prevent it. "These restrictions make no sense," he said. "No person has ever escaped from one of our supermax or military prisons here in the United States — ever. Our courts have convicted hundreds of people for terrorism-related offenses, including some who are more dangerous than most [Guantanamo] detainees." Given his administration's "relentless pursuit" of al-Qaida's leadership, "there is no justification beyond politics for Congress to prevent us from closing a facility that should never have been opened," he said to applause. The applause was quickly followed by a protester, repeating, "Close Guantanamo!" "Ma'am, let me finish," the president said after the unidentified woman interrupted his speech for the second time. "Part of free speech is you being able to speak, but let me speak, too." The American Civil Liberties Union praised the president for "encouraging and noteworthy actions" regarding drone strikes and the transfer of Guantanamo detainees. "Yet the president still claims broad authority to carry out target killings far from any battlefield, and there is still insufficient transparency," the statement said. "We are particularly gratified that President Obama embraced our recommendations to use his authority to allow prompt transfer and release of Guantánamo detainees who pose no national security threat and have been cleared by the military and intelligence agencies," it said. "But there are other problems that must still be addressed. The unconstitutional military commissions must be shuttered, not brought to the United States." The Associated Press identifies the woman who interrupted the president three times during his speech as Medea Benjamin from the anti-war group Code Pink. "Obama said at one point he was willing to 'cut the young lady some slack' because the issues he was addressing are worth being passionate about. "That appears to be a reference to detainees who remain in Cuba despite being cleared for transfer from the facility."